Shouldham Thorpe is a pretty little village, not far from the Downham Market to Dereham road. The neat, trim, wedge-shaped graveyard is overhung with trees, and St Mary is that striking sight, a gingerbread church built out of carstone. The building was erected in 1858 to replace one which had suffered a collapsed tower just over a century earlier. The former north doorway, a fine Norman rounded arch with columns and zig-zags, was reused at the west end of the new church, which is architecturally odd but rather pleasing, especially as it is set in the expanse of such a large gable wall. 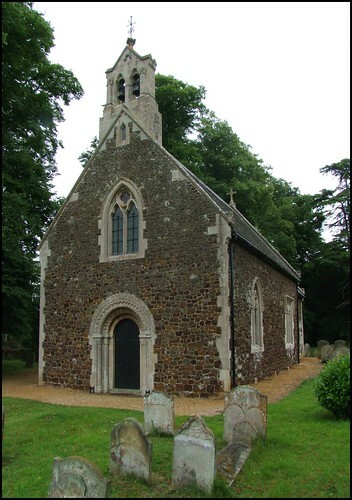 This is very much a locked-church area of Norfolk, but St Mary did have a notice telling you who to contact if you wanted someone to give you a tour of the inside. I have to say that from reading the literature and peeping through the east window, I did not think that a tour would take very long. But there is one important survival here, the memorial to three children of Thomas and Frances Steward, which was reset on the south wall of the new church. They died in the last years of the 16th Century, and the memorial depicts them kneeling in a row. You can also see them on the village sign across the road. I would have liked to have seen the memorial, but the afternoon was getting late; the first number did not answer, and I didn't much fancy having to trawl around the village looking for someone to give me a guided tour of a building which I really thought had no reason to be kept locked in the first place. And so we headed on to Shouldham, where I would discover that the far more significant church there was also kept locked, but without keyholders, which made me think far more kindly of the parish of Shouldham Thorpe.